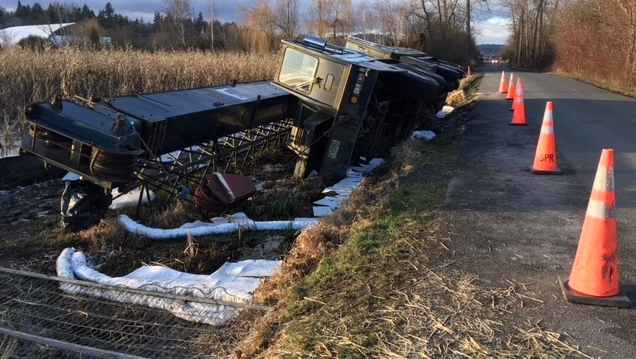 A crane truck that fell on its side and right on top of a water main in Central Saanich will finally be removed on Thursday. Crews are beginning to prepare the crash site on Lochside Drive before they recover the truck. As a result, Lochside Drive will be shut down between Martindale and Island View roads from Tuesday until Thursday. The crane truck fell on its side on Jan. 24, as it headed northbound on Lochside Drive. It landed right on top of a Capital Regional District water main that supplies water to the Saanich Peninsula. The recovery process has been difficult because crews are trying to remove the truck without damaging the main. The CRD is leading the recovery effort.